South Korean auto parts maker Hyundai Mobis is seeking collaboration with two local startups selected through its M.Start contest in an effort to gain the upper hand in in-demand mobility technologies, the company said Thursday. Genesis Lab and Linkflow were chosen among 155 candidates for their artificial intelligence-based image and voice recognition technologies. “The latest cooperation is aimed at advanced acquisition of innovative technology. Mobis will lead the market by boosting cooperation with up-and-coming local startups for leading technology,” said Baek Kyung-kuk, senior vice president of Mobis’ R&D planning subdivision. 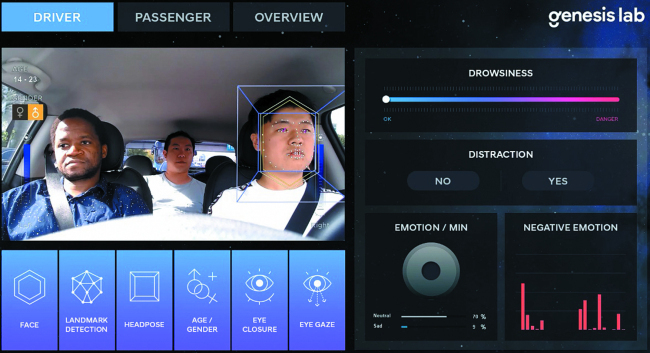 As automakers compete to roll out vehicles equipped with cutting-edge infotainment systems and features for enhanced convenience, Genesis Lab was chosen for its AI technology that changes interior lighting and music upon analyzing the driver’s emotions. The same technology can also be used to prevent the driver from dozing off behind the wheel and drunk driving, among other functions, Mobis said. Meanwhile, Linkflow has infotainment technology that enables passengers to watch videos and shop by using car windows as display screens. As part of the partnership, Mobis plans to set up a venue to exhibit technologies developed by Genesis Lab and Linkflow at next year’s Consumer Electronics Show. Mobis added it hopes to spearhead the creation of synergy and a virtuous cycle between startups and conglomerates.